Have you ever wondered about the benefits of washing your clothes in soft water? You’ve come to the right place. We’ll explain how soft water can prolong the life of your favorite pair of jeans. Everybody at one time or another has had a favorite pair of jeans. And everybody has watched as each trip to the laundromat stole a little life from those jeans until one day you couldn’t justify holding on to them anymore. It’s a sad day when we have to toss out that perfect pair of jeans. But there is a way to prolong the life of your favorite clothes, and it has nothing to do with the kind of detergent you use. It’s all about the water. Soft water could keep you in that favorite pair of jeans for longer than you might think. To address this question, let’s take a look at what hard water is first. Water is considered “hard” when minerals like calcium and magnesium are present. So, in other words, hard water is water that contains varying levels of minerals. Calling water “hard” may sound scary, but in reality most of the water we drink and use on a daily basis is hard water. Soft water is the less common type of water. As you’ve probably guessed, soft water is considered “soft” when these minerals are removed from the water using a water softener. The result is a purer form of H2O. All things considered, your favorite pair of jeans would prefer taking a bath in soft water. It’s not that hard water is a bad thing. It’s the most common type of water out there, and most laundromats use it. But the lack of minerals in soft water has its advantages. Clothes will last longer and stay brighter if they’re washed in soft water on a regular basis. That’s because hard water leaves minerals in the weave of most fabrics over time. As a result, clothes start to look dull and dingy sooner. Soft water has more washing power than hard water, so you don’t have to use as much detergent to get the same results. You may find that you can use ½ to ⅔ less detergent to get your jeans clean. When you wash your clothes in hard water, you typically will have to use warm or hot water to get your clothes clean. This is because hard water leaves minerals on your fabrics that are easier to rinse off with hotter water. 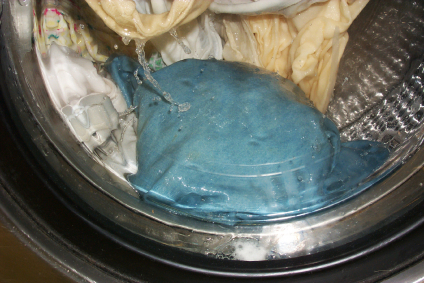 When you wash your clothes in soft water, you can use cold water and get the same results. Washing your favorite pair of jeans in soft water is one of the best ways to keep them in pristine condition. That is until you find that next favorite pair. Stop by your neighborhood NJ Laundromat and see us soon!